NHL teams are in rest and recovery mode. The NBA have also completed their season. 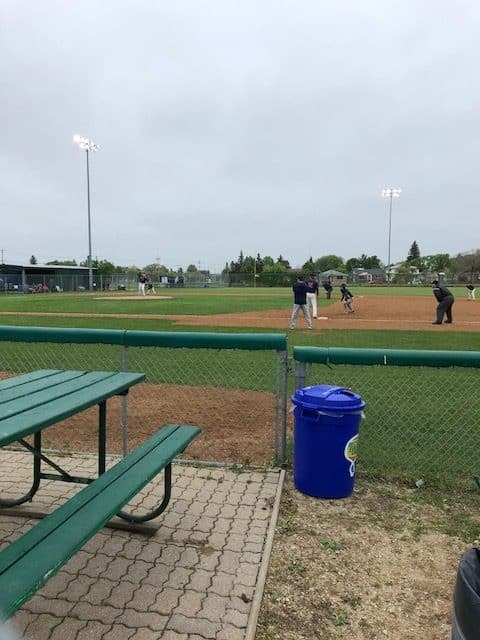 Summer sports are heating up, with the Winnipeg Blue Bombers winning their first pre-season game on June 1st and the Winnipeg Goldeyes sitting at 8 wins and 6 losses as of June 2nd. 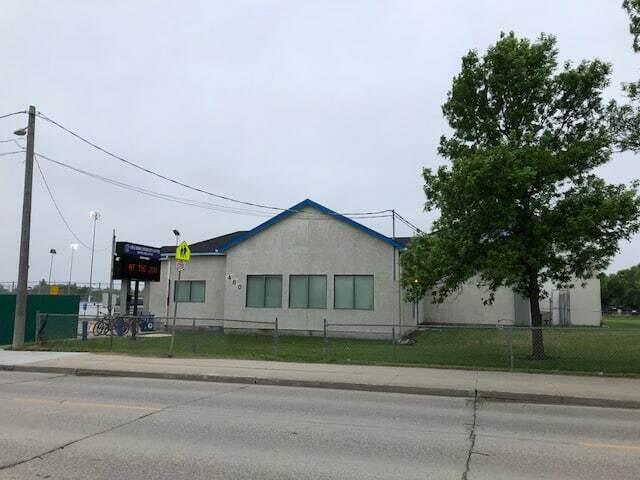 With summer sports in full swing around the city and record breaking heat in May, it was only fitting that, as baseball and soccer tournaments took place the first weekend of June, the weather would not cooperate. Fortunately for sports card collectors, it was a perfect day to enjoy being indoors. 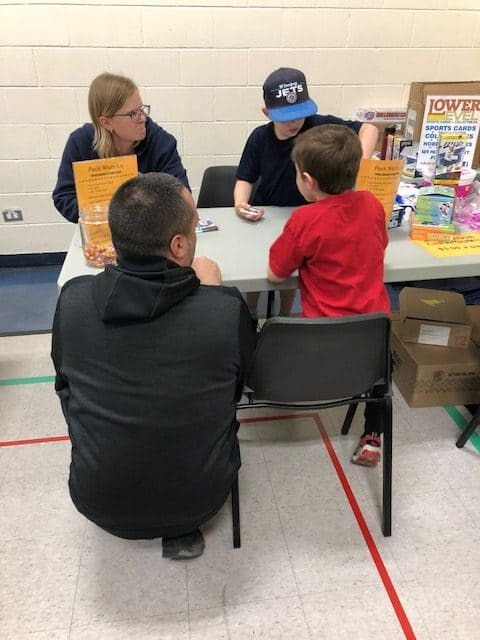 Chalmers Community Centre played host to the third fundraising sports card show of 2018. 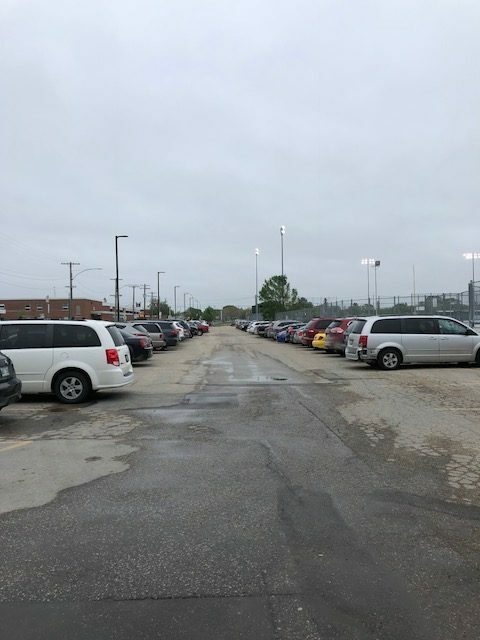 Plenty of free parking at Chalmers. An Elmwood Giants team playing baseball on a cool, drizzly June day. 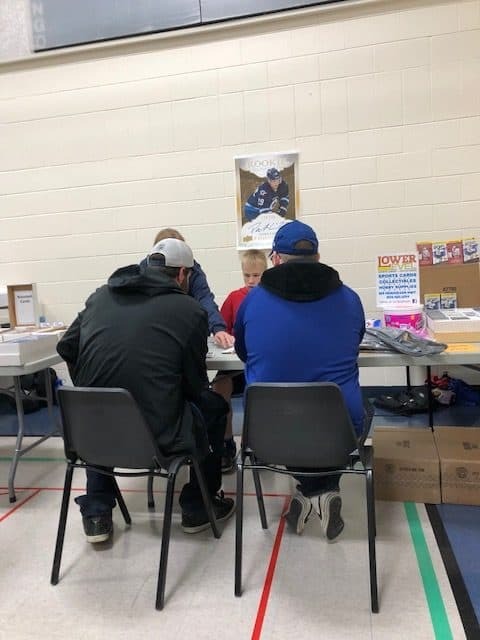 To date, approximately $1900 has been raised for the Elmwood Giants baseball program. 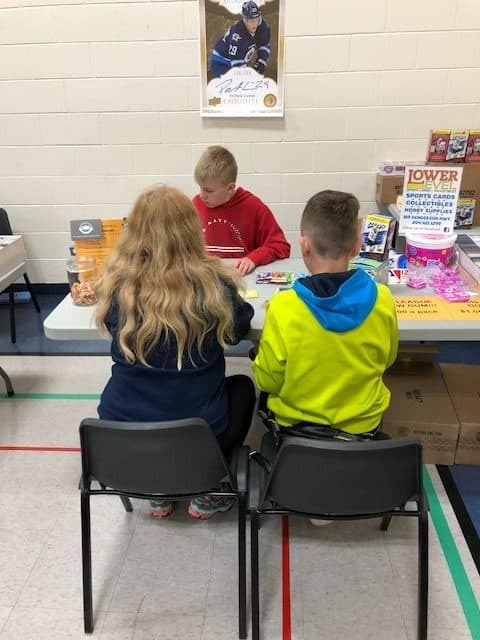 This money came in from the sports card shows held at Chalmers Community Centre. 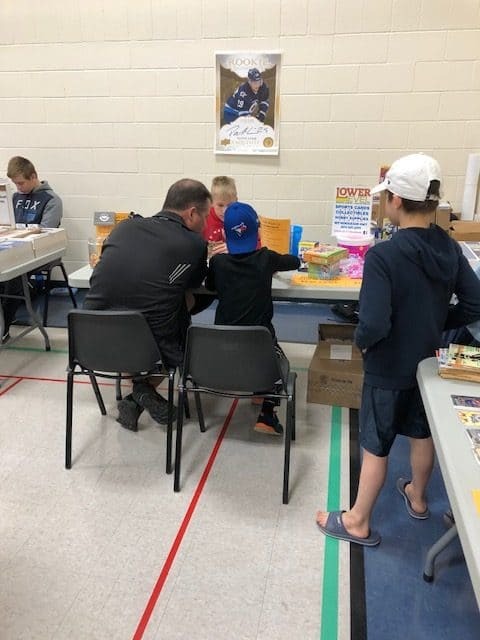 Six baseball teams – and one learn-to-play program – that fall under the Elmwood Giants name, will benefit from the proceeds. 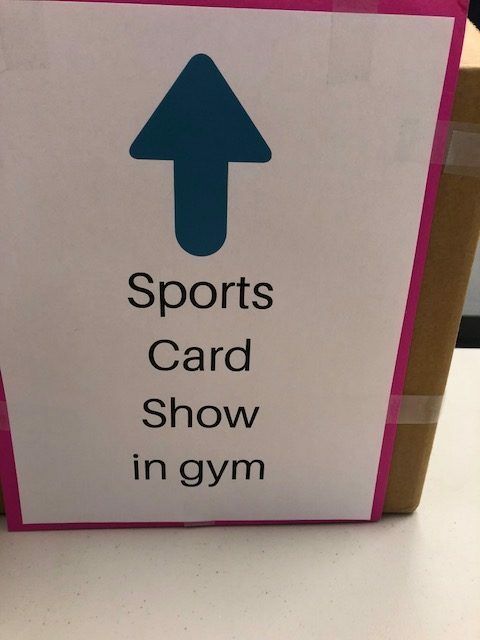 Follow the arrows to the Chalmers Community Centre gym. 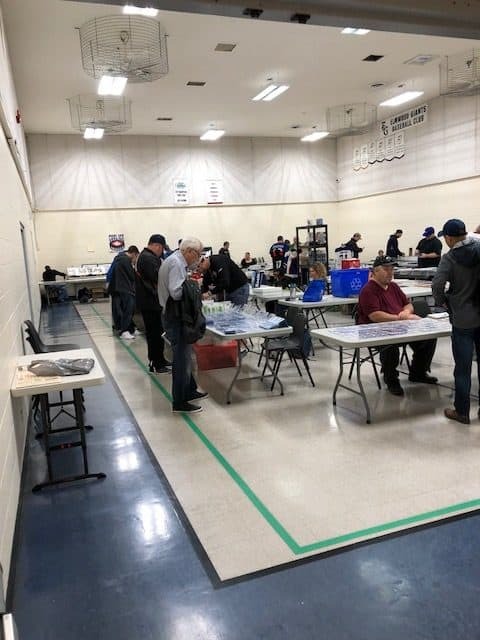 Collectors and vendors warm and dry inside Chalmers Community Centre. 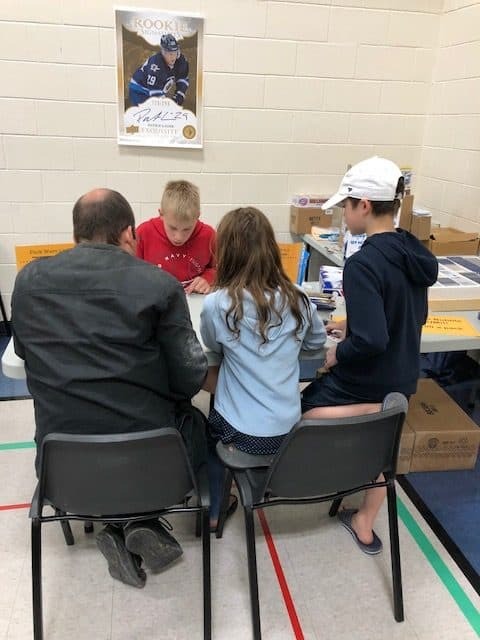 At the third and final card show at Chalmers Community Centre, I was once again drawn to the artwork of Sebastian at Cool Ice Images. 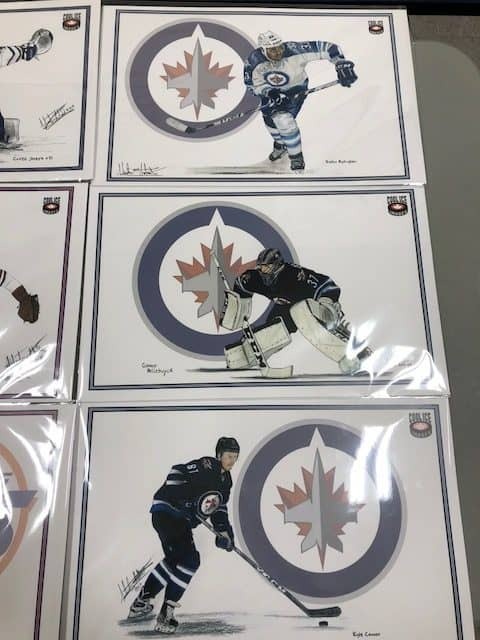 Dustin Byfuglien, Connor Hellebuyck, & Kyle Connor. 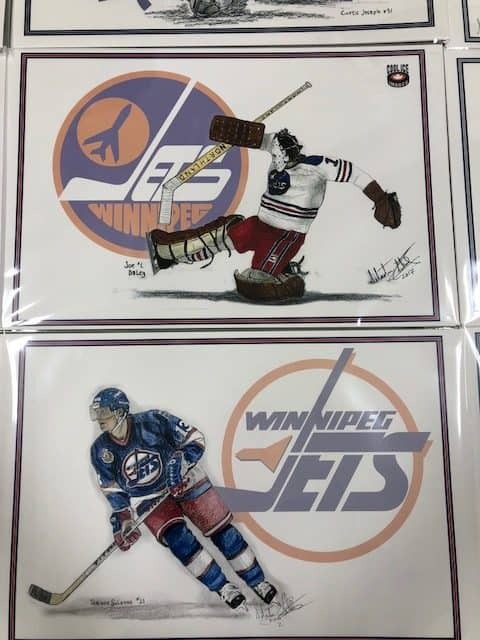 Joe Daley & Teemu Selanne. 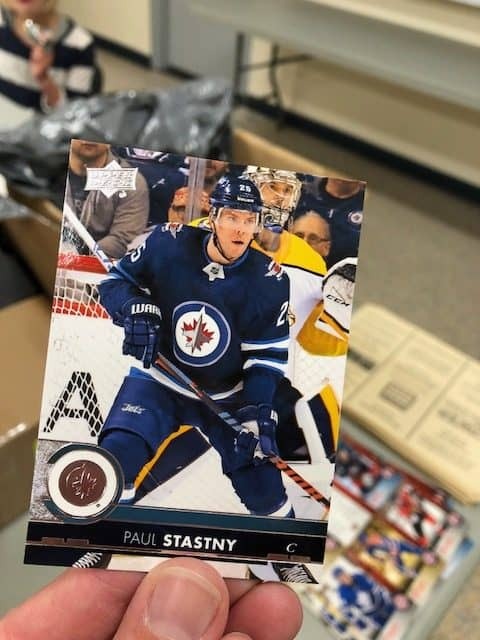 I was also excited to get my hands on the first hockey card of Paul Stastny dressed for the Winnipeg Jets. Paul Stastny dressed for the Winnipeg Jets. 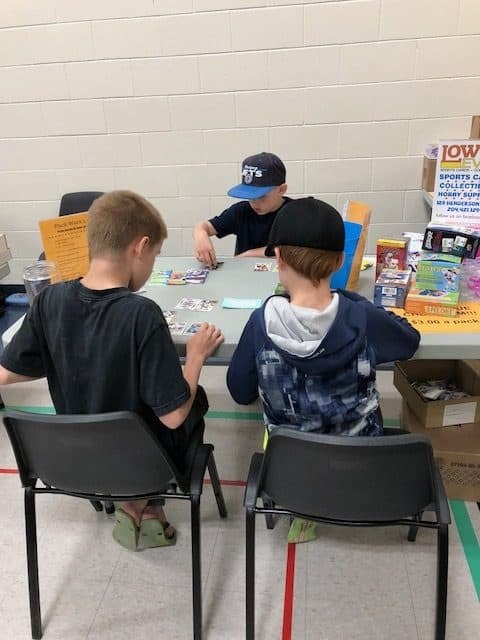 This is the third time I had brought Pack Wars 2.0 to a card show. And it was definitely the most interest I’d seen from show attendees. 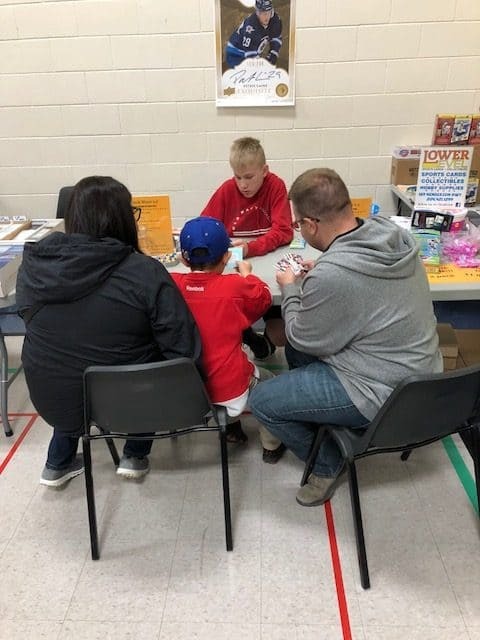 There were more than twice as many kids, adults, and families playing Pack Wars than had played at the May card show! This is just a small sampling of the players drawn to our fun family game. 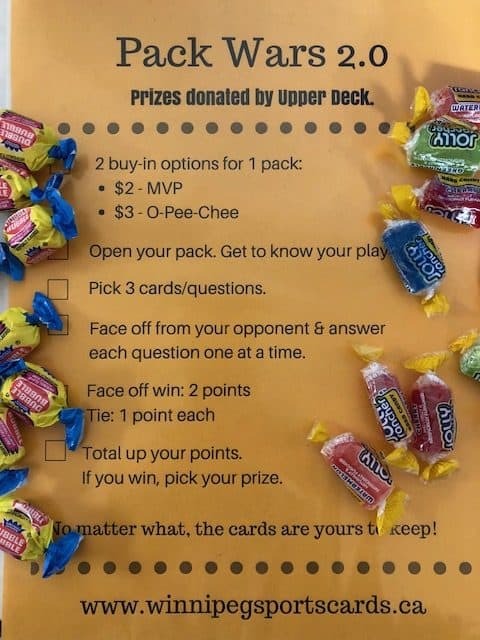 If you’ve never heard of Pack Wars, here is the version we play. It’s not a game of skill. All you need is two eyes and the ability to count. 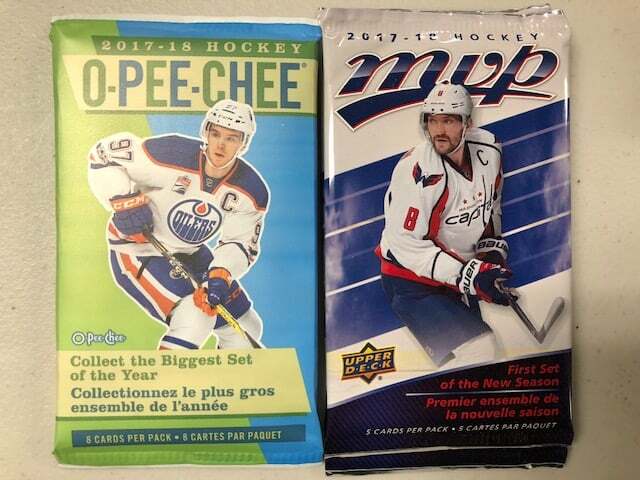 Pick your pack – MVP or O-Pee-Chee. Answer 3 – 5 questions. And the winner gets to pick a prize. I captured these two very happy winners! Thanks Upper Deck for the Jack Roslovic autographed cap. His 2 favourite players! 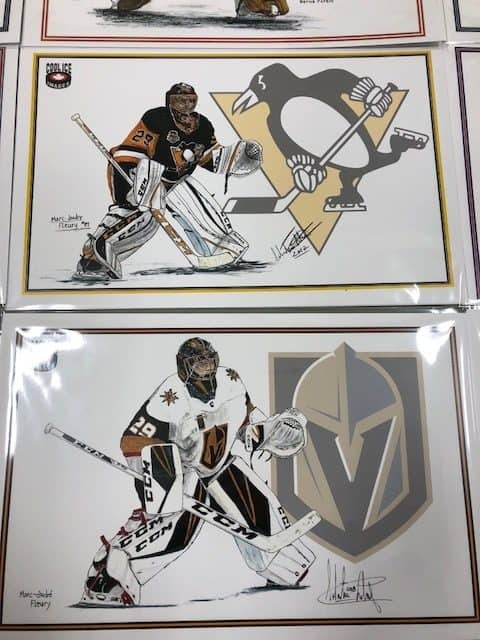 Fleury and Ovechkin. Everyone who played Pack Wars 2.0 had a great time and several kids came back to play again and again! 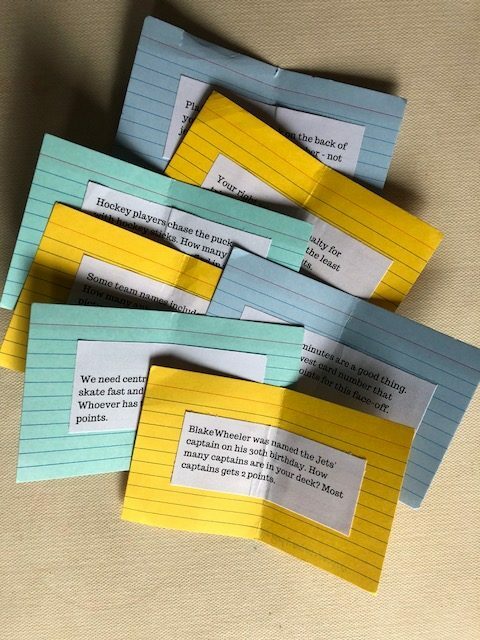 Pack Wars is a great game to get kids doing some basic reading and math skills and it’s also fun to open up packs and find some cool cards. 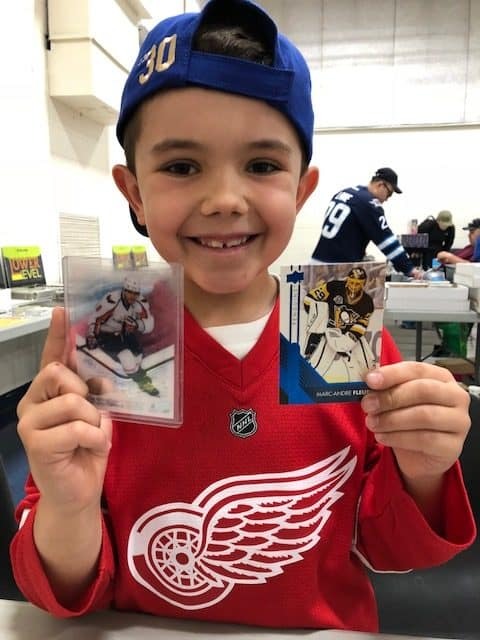 The next card show in Winnipeg will be on September 29th at Bronx Park Community Centre. 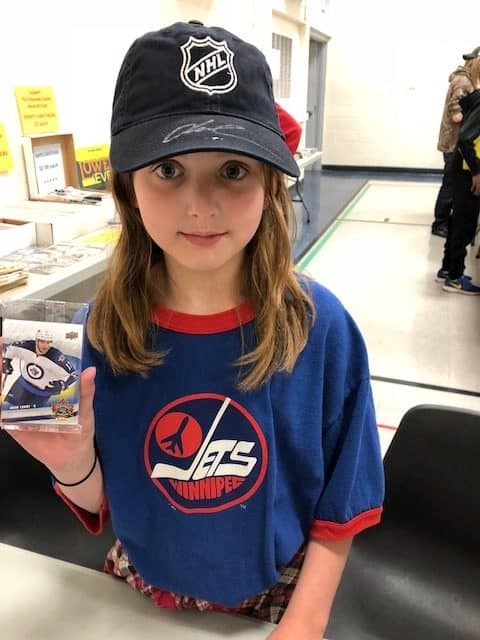 If you don’t want to forget about it, sign up for the Winnipeg Sports Card email newsletter on the home page. If you do, you’ll receive the free version of Pack Wars 2.0 for hockey along with all the details of our upcoming summer contest for families!